If we got a nickel for every time a supposed image of the upcoming Galaxy S III was found, we would have a lot of nickels. 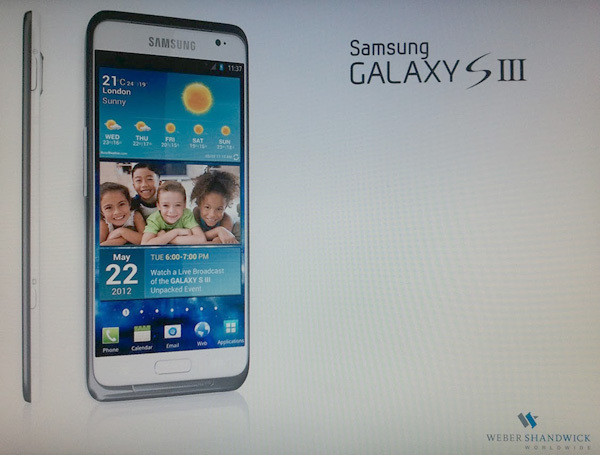 Another one of such images for the Galaxy S III has surfaced but we must say, out of all that we have seen so far, this one seems to be the most convincing. A few things are in its favor. First of all, the design looks more like something Samsung would actually design and less like the fantasy of a Samsung fan somewhere with Photoshop on his PC. There are some interesting elements here worth noticing, such as the edge to edge display, loudspeaker placed at the bottom edge on the front, dedicated camera shutter and an incredibly thin profile. Poring over the screenshot, we see the date May 22 along with the mention of Samsung's Unpacked event, which could just be when the phone gets launched, assuming this image is real. Lastly, on the bottom right it mentions the name of Weber Shandwick, a PR company who has a history of working for Samsung. There are a couple of unusual things about the picture, though. First of all, the design is unlike the first two Galaxy S phones. The design of the S II was clearly an evolution of the first phone; it even had that bump on the back at the bottom. In comparison, this image of the Galaxy S III is very different from the first two phones, which strikes us as a bit odd. Secondly, the display has five icons on the screen near the bottom. The only Samsung phone that has five icons is the Galaxy Note, but only because it has a ginormous display that can accommodate them. Unless the Galaxy S III has a 5.0+ inch display, it would be unlikely that it would have five icons because then they would be too small. It also seems unlikely that Samsung would have two 5.0+ inch models at the same time. Clearly, that display segment is reserved for the Note. The presence of the camera shutter button also raises a few alarms in our head. When was the last time Samsung had a dedicated camera shutter button on an Android device? So even though this might seem like the most convincing image of the Galaxy S III so far, we would advise taking it with a pinch of salt. If it really is fake, to whoever that made it, well trolled.